September personal income figures released yesterday show an increase in spending relative to income. This is not good news because the higher spending means savings rates are down and household de-leveraging and spending adjustments are not proceeding. Table 1 shows the current savings rate and spending rates (quarterly) during and subsequent to the recession. 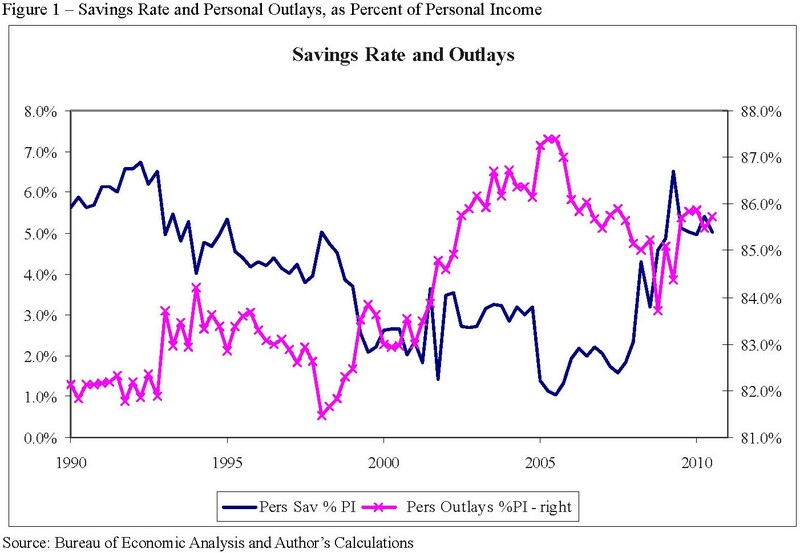 The savings rate for the third quarter of 2010 is dramatically higher than for 2007 (5.0 versus 1.6 when measured versus total personal income). But almost all of the change in savings rate has been due to falling taxes rather than lower spending: the savings rate rose by 3.45 percentage points with only 0.17 points due to lower spending and fully 3.28 points due to lower taxes. Table 2 shows monthly figures for 2010, with September personal outlays as a percent of income rising and savings rates falling. I don’t think the imbalances that led to the financial crisis of 2007-2009 are fully redressed (at least in the US). Spending is supported by low taxes (an explicit government policy to ameliorate the recession of 2008- 2009). Eventually taxes will have to rise to fund the government deficit, and this will put pressure on spending. Either the savings rate will fall (building future imbalances) or spending will fall (recession). 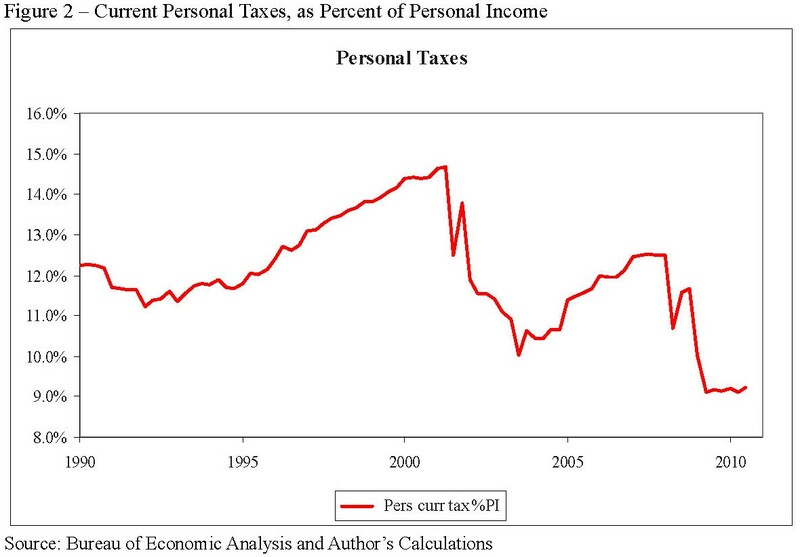 Taxes rose during the late 1990s but fell dramatically post-2000, and again in 2008.